* CEP classes are offered through USA Hockey in the fall of each year. * Click here to find classes. 2. Completion of Midget Age Level Module (this is a one time certification so if done already do not need to do again). * Modules are now available year round. * There is a $10 fee to take the module. * Plan to spend about 8-10 hours on the module. * Click here to access the online modules. * There is no charge for the Concussion Training. * It takes about 30 minutes to complete the Concussion Awareness Training. * Click here for online training. * Print out the verification of completion and give it to your team’s manager. 4. CAHA registration for background check (must be done once a year, so if already done this fall or winter then all you need to do is add HPHL to your profile). * Click here to register with CAHA. * Click here for SafeSport Training. Must have a minimum of 13 skaters and 1 goalie per team. If fielding a team with less than minimum numbers a waiver will need to be filed. A team can have up to 30 players on the roster. No more than 20 players can dress and be on the bench for a game. Of the 20, no more than 18 can be skaters. No more than 4 staff members (all of which must be credentialed and registered as coaches) can be on the bench for a game. Midget Major AAA, Midget Minor AAA and Junior players are not eligible for JV teams. All other players, regardless of year in school are able to play on a JV team. Each club must field a varsity team. Additional teams will be placed into divisions (v or jv) and tiers by HPHL. We suggest rostering a smaller top level team and then pulling players up from a second/lower team, if your club has one, as needed. Once a JV player has played in 4 Varsity games they are no longer eligible for JV. The same 4 game rule applies to players being pulled up to a higher tier Varsity or JV from a lower tier Varsity or JV team. HPHL forms it’s teams around schools and school boundaries, so prior to telling a player from another school that he can play for you, please check with the league. Each team has a certain number of hours for ice touches allowed. It is up to the team how to use that ice. It can be used for tryouts, practices, and/or non-league games. If you plan to hold tryouts, your team manager will need to work with the scheduler to select times and dates. Anyone that plans to be on the ice MUST be registered with USA Hockey as either a player or coach. Volunteers, even if registered, are not allowed on the ice. As of 3/1, teams shall only hold practices as assigned by the HPHL scheduler. No purchasing of extra practice ice. Varsity games – three 17 minute periods, with an ice make between the second and third period. JV games – three 15 minute periods, no ice make during game. Girls’ games – three 15 minute periods, no ice make during game. All start of game warm ups are 5 minutes. There is no additional warm up prior to the third period for varsity. HPHL has a six goal mercy rule in the third period. If there is a six or greater goal differential during the third period, the clock should go to run time. If and when the goal differential drops below six goals the clock reverts to stop time. All regular season games are subject to a curfew. When clock time remaining is equal to remaining scheduled game time the clock should go to run time. There is no overtime during the regular season. Games can end in a tie. All game cancellations MUST be approved by the scheduler. There is a $500 fine for refusal to play a game. Fighting game misconducts assessed under Rule 615 a, or d result in a one game suspension plus a $200 team fine. Fighting game misconducts under 615 f results in a 3 game suspension (per USAH rules) and $200 team fine. Abuse game misconducts assessed under Rule 601 d and e also result in a one game suspension and a $200 team fine if a player is assessed the penalty; 1 game suspension, but no fine if a coach is assessed the game misconduct. HPHL can NOT overturn penalties called by the officials or suspensions issued by CAHA. JV players can be pulled up to play in Varsity games. Once a JV player has played in their fourth Varsity game, they are no longer eligible for JV games and must remain on Varsity. The same 4 game rule applies to lower level Varsity or JV players pulled up to a higher tier Varsity or JV team. Skaters cannot be borrowed from other clubs, nor can they play any games on a lower team than the one they are rostered on. JV goalies can be pulled up as a back up goalie for Varsity games. These games do not count against the goalies JV eligibility unless he/she actually plays in the game. Once they play in their fourth Varsity game, they can no longer return to JV. The same rule applies to lower level Varsity or JV goalies being pulled up to a higher tier Varsity or JV team. A higher level team’s goalie is allowed to sit on the bench as back up for a lower tier game, but is NOT allowed in the game unless the lower tier goaltender is unable to continue. In the event that a team has NO goaltenders available for a game, the team must request permission and obtain approval from the league to use an emergency replacement goalie. This must be another goalie currently registered with HPHL. HPHL participates in the Avalanche Hobey Baker Award program each year. Each club with a varsity team, that has not already selected a player through their CHSAA team, and each girls' team is asked to select one player (a senior) to receive this award. This is not a MVP award, rather a character award. It should go to the “best person” on the team. The selected players will be honored at an Avalanche game (typically in late March or early April) and if submitted prior to 3/26 will also receive a plaque. More information will be coming from the Avalanche in early March. 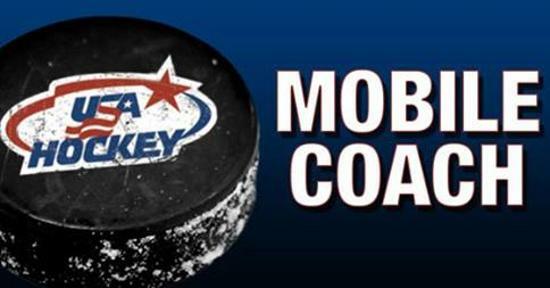 Visit the ITunes App store to get the Mobile Coach App.